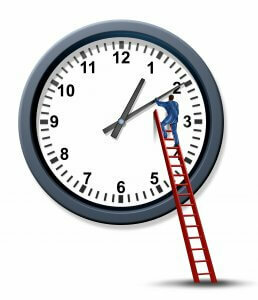 One of the biggest challenges many people face is changing their unproductive time management habits. Here are 3 techniques our trainers use to enable people to change their poor work habits. I know, it takes time to do this - time many busy people say they just don’t have. But honestly it is worth the effort! If you wanted to save money, then you would start by logging where your money was spent and if you wanted to lose weight, then you would log everything you were eating. Managing your time is no different: if you want to know how you use this valuable resource then you must start by logging how you currently use your time. Logging what you actually do for a week, and then taking time to review the decisions you made on what to do/not do and the impact of these decisions is a revealing exercise. By using the data you gather you will quickly identify habits that, if changed, would make a big impact on your time management. Start by writing down your top three priorities. Then write down the three main activities you do to achieve these three priorities. • Attending client review meetings. So for me these three activities are (or should be) my priority. The key to better time management is then to focus on these big activities, knowing that the rest will work itself out. We all can be sucked into the 24/7 mentality - thinking that we are indispensable and must be available and working every hour there is. But this will lead to exhaustion and burn-out. Exhausted people are not efficient and make poor decisions. By ensuring you have down-time and a more balanced life style your productivity will actually increase. You will have a clearer focus and be better able to be more creative in your problem solving at work. Hopefully these three tips will have given you some ideas to improve your own time management habits but if you want to learn more then why not attend our time management masterclass.